I exited the apartment to beautiful clear skies with sparkling stars overhead.I picked up a Tim Horton’s coffee and bagel before heading South on Highway 69.Driving down the Killarney highway was uneventful other than two foxes.As I drove through Killarney Provincial Park at the main campground I noticed a few empty campsites along the way.I was told that there would be no campsites available during July and August so go figure. I parked at the East end of the campgrounds on George Lake.There was wind gusting on the lake creating a ripple.I loaded up my camera gear and headed to A Y Jackson Lake.The first part of the trail is the hardest part as it is a fairly steep climb up,but after that it is a good go. I arrived at A Y Jackson and to my surprise the lake was calm for the most part.The sun was now highlighting the trees on the hilltops so I got off a few shots.I continued along the trail going East and came upon Little Sheguiander Lake.I checked the campsite here and it was empty.By staying up on the ridges I was looking for different shooting angles.At one point I was checking out a location and when I turned to go back up the hill I noticed a doe standing not 30 feet from me.With ears forward and a alert look she eyed me for a moment and then bounded along the hillside before disappearing. 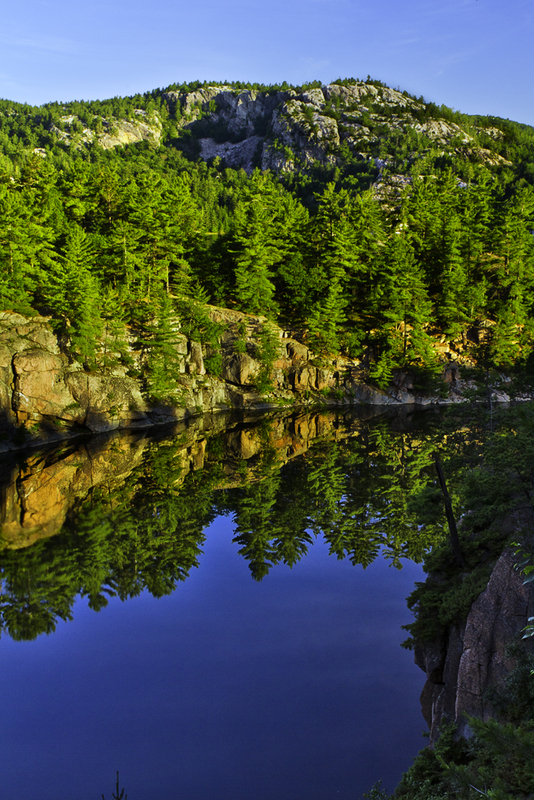 I captured the above photo in one of the locations I found.The problem here was that down in Little Sheguiander it was still heavy in shadow where as the upper part of the photo was quite bright from the early morning sun.By putting part of a rock face and a bent evergreen in the foreground to create depth with the La Cloche Mountains in the background you can create a very nice scenic.The reflections in the lake were right on along with the reddish orange of the rock faces.I shot this composition with a zoom setting of 28 mm to keep things tight and a shutter speed of 1/5 sec @ f22. I continued along the hillside above the lake capturing more shots before making my way down to the George Lake shoreline. To my surprise I was able to get some really good shots as the water was fairly quiet.You had to shot between the light wind gusts.I managed to get a really nice pano. It was now 8:30 AM which in it self was remarkable in that the wind held off for the most part.I am usually finished photographing by 7:00 AM.By now canoes were gliding through the water heading to the portage at the East end of George Lake.The wind was picking up so I layed down on the flat rocks on the George Lake shoreline and had a nap.I awoke to the sound of water lapping up on the rocks and noted that the wind had picked up.